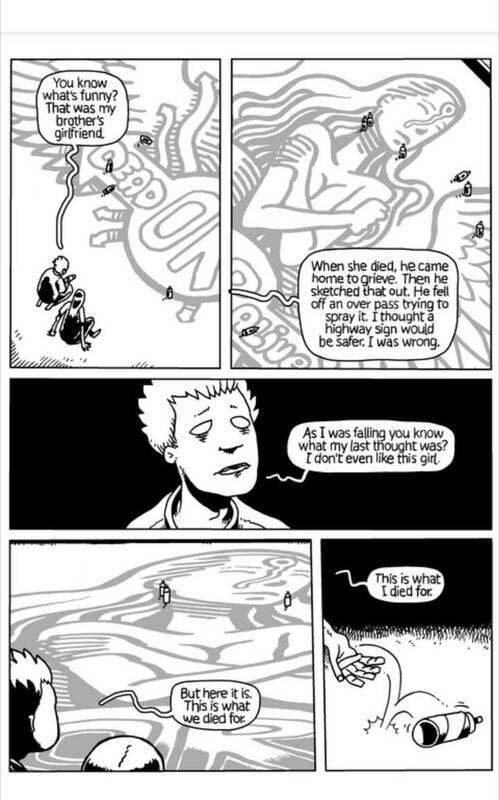 What if life after death was a different form of life? What if you needed to eat, drink, sleep, and take medication, but could remember your previous life and remember the details of your death? Writer Don Juan Mancha III has created a world where the characters are all dead. They reside in a city, have jobs, have friends, and have medical conditions. But each of them are died in various ways, and their eyes are literally black, or white, or empty. Witnessing the characters accept that reality, but only infrequently confront it, and the impact their deaths might have had upon those left behind, is profound. For the most part the dead choose to carry on and fulfil an existential purpose as if they were alive, almost out of momentum or a lack of insight as to what else to do. To be clear, these characters are not zombies. They are dead people living in an existence which mirrors our own. There is a palpable sense of muted activity, as if the characters are all moving under a blanketing malaise. It is a new and different vision of purgatory. “Purgatory” is usually regarded in the Christian mythos as a safe harbour after death, where the soul of those with lesser faults is purified prior to entry to heaven. It is a place of penance. But it is not clear precisely what sort of penance is occurring here. One of the curious, almost unnoticed things about the landscape to this story is the lack of people. One section of the city is called “The Empty” because of the entire absence of any population. Only once do we see a crowd, and it is a small one. The suggestion is that Purgatory is one minor destination of many for the dead. The other interesting aspect to this post-death world is the logistics of supply. Shelves as stocked when trucks sporadically arrive. When they do not arrive, shelves are empty. Which begs the question: from where do these trucks come? And who drives them? The main character, Ryan, is a teenager who died too young, falling with his spray can from a freeway billboard. He stocks shelves in a convenience store, and shares a house with Vincent, who lays on the couch drinking and watching television. If Vincent had any motivation in life, it seems to have evaporated in death. The two characters knew each other when they were alive, but the suggestion is not well. Ryan takes an anti-schizoid drug. This is of itself an interesting concept, that a mental illness could survive death (and indeed, we learn that other characters suffer from issues like arthritis, insomnia, and that most pedestrian of ailments, the hangover). We observe Ryan work through his last pill. As a consequence of the very early introduction within the story of mental illness, the reader can never be sure about the story on two levels. First, is Purgatory a concept entirely existing in Ryan’s head? And if not, then second, are the unusual events that we witness a product of Ryan’s schizophrenia, or is something else truly odd is happening? This is the action to the plot. 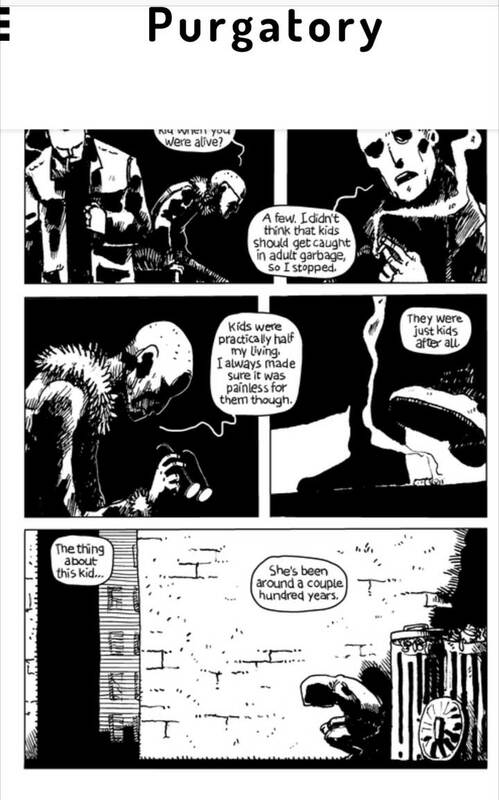 In the first issue, Ryan stumbles across the attempted abduction of a young girl in an alley in The Empty. He hesitatingly intervenes against the two thugs, who from their conversation appear to have been hard and cruel criminals when alive and remain so. (The dialogue around this is very well crafted.) But the girl, who has been in Purgatory for hundreds of years, is aware of the plot to kidnap her and has some surprising resources to call upon: a cat which can apparently throw a car from a rooftop; a toy robot which can suddenly become enormous; and a trapdoor which accidentally snaps down on Ryan. The girl, who Ryan has never met, then asks Ryan by name for ongoing help. He assumes from the bizarre events that he needs to top up on his medication, and walks away. Later, in the second issue, the girl seems to climb out of a magazine, again seeking his help. The trapdoor is marked with a circle. When Ryan died, he was met by a hooded figure featuring the same circle on the palm of his hand. One assumes that the girl is part of the establishment running Purgatory. Why she requires Ryan’s help has not been revealed. We started this critique with a series of questions, and we are left with only one: why is this comic not being published by Image Comics or Vertigo Comics? 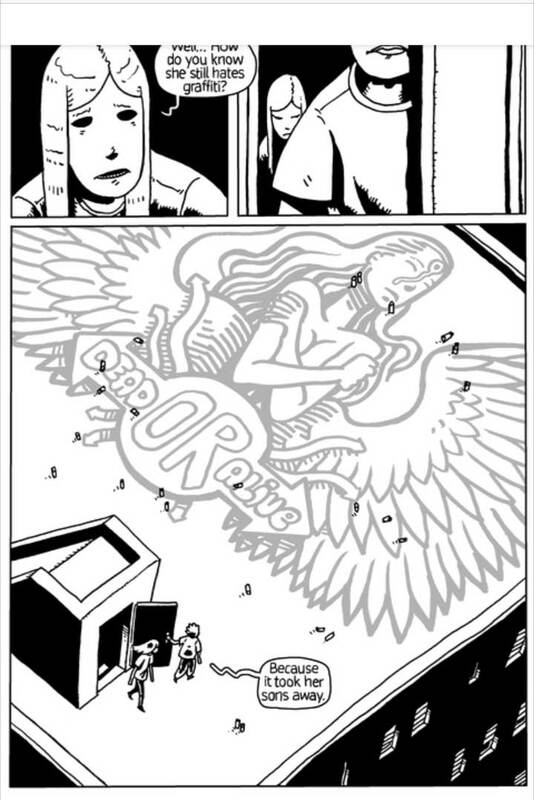 Purgatory is a webcomic, and Mr Mancha does not charge for access. This is a very high quality and remarkably innovative title which has inherent value, and really should not be free. We know nothing of Mr Mancha outside of this comic, other than he should be gainfully employed by a large comic book publisher.